If we must have an Internet of Things, it makes no sense to leave clothes out of the party. But clothes must be worn, washed, bunched up and folded — it’s hard to make electronics that can survive all that. Plenty are trying, though; the latest attempt is from Harvard’s Wyss Institute, which uses a simple but effective layering method to make a durable, customizable flex sensor. The way the layers are assembled, with the fabric laid on the liquid silicone and allowed to cure, physically locks the layers together. So the signal is more predictable and the fabric always returns to a base capacitance — meanwhile, even slight bending or stretching instantly produces a measurable change. It also works when chopped into arbitrarily sized and shaped pieces. 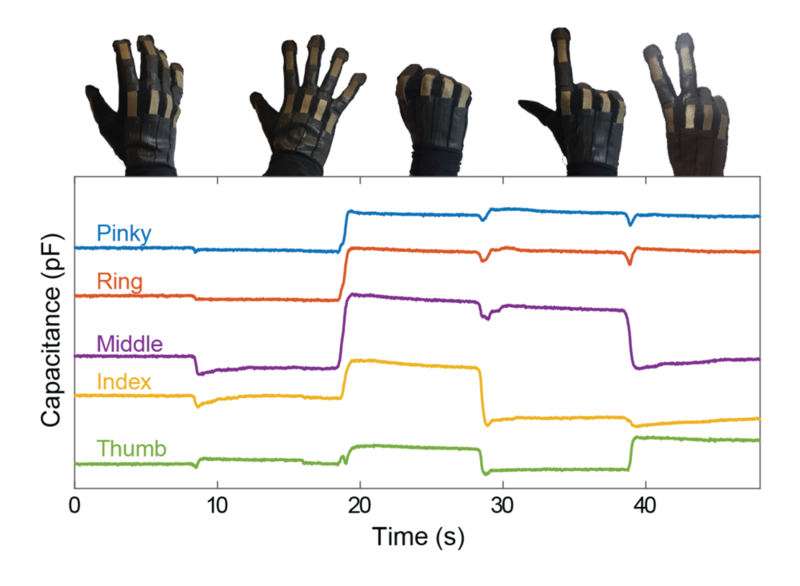 The team put together a glove using multiple pieces of the material, and found that fine movements of the fingers could be detected easily. “Our sensor’s greater sensitivity means it has the ability to distinguish smaller movements, like slightly moving one finger side-to-side rather than simply whether the whole hand is open or clenched in a fist,” explained graduate student Vanessa Sanchez, co-author of the paper describing the material, in a Harvard news release. That could be a boon for all kinds of industries, from sports to virtual reality. Many current solutions for body tracking are rigid and weird, like exoskeletons that fit onto your knuckles or stopwatch-sized trackers mounted inside athletic garb. This material is still in its early days, however. Because the signal is so simple, it can’t be fundamentally directional without some careful tweaking — meaning the system could only tell that a piece is bending, not that it’s bending to the right or left. I have faith that clever engineers will solve that problem, though, whether by signal processing or different ways of cutting and attaching the material. The team details their process in the latest issue of Advanced Materials Technologies. If you’re interested in trying it yourself, it’s also documented at Harvard’s Soft Robotics Toolkit.